Standby Time: Suggest recharge it 3 months. It can jump start your vehicle up more than 30 times with 400 amps of peak current. It takes around 4h for one full charging with the household battery charger or car charger. 1.Press the blue button to Turn on the machine, it will display the Voltage of your battery. 2.Connect one red positive (+) cable end to the positive (+) post of the battery. 4.If could not start, Press the red button, than you can start the engine again(When the battery shortage badly). The idea comes from the shape of a peanut, cute and fashionable. Jump Starter : 12V output. Fits for your coupe, sedan, pickup, small truck or ATV up to 6.5L Gas or 5.2L diesel. Jumping current can reach up to 800amp. The battery capacity is 12600mAh with excellent discharging and starting. Portable Power Bank: 5V/2.1A USB output. Use it to charge your phones, tablets, kindles and other mobile devices. Easy Storage: 0.78' ×0.26'×0.16'ft, similar size as a bottle of mineral water. Just put it in your glove box of your vehicle. 7 × Safety Protections: high temperature protection, low temperature protection, over-charging protection, over-discharging protection, short circuit protection, reverse current protection & wrong connecting protection. 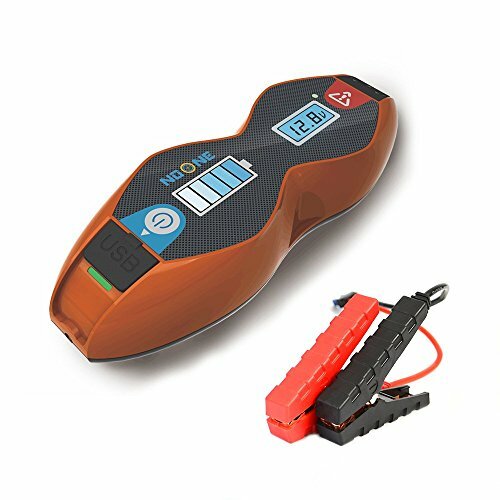 ONE YEAR WARRANTY and WHAT YOU GET: NoOne Lithium Ion Jump Starter, jump cables, 12V wall charger, 12V car charger, use's guide. Free repair or return policy within the warranty period. If don't know how to use, our company provides free technical support. If you have any questions about this product by NoOne, contact us by completing and submitting the form below. If you are looking for a specif part number, please include it with your message.